With more then 30 combined years in the Floral and Gift industry our staff of competent designers and sales personnel are sure to find the perfect solution to your flower needs. 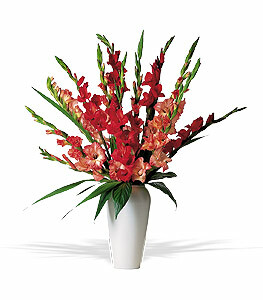 Arrangements are custom made to your specifications using the freshest flowers available. Designs from Traditional, Contemporary, Tropical or Abstract are available. 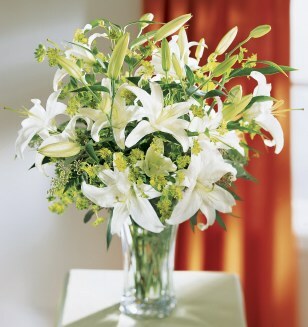 Most arrangements can be made in a variety of price points still maintaining the overall feel of those shown below. Colors may also be substituted to coordinate with a particular scheme or holiday. When you are unsure of what to choose simply tell us what occasion the flowers are for, who they are going too and the price you wish to spend, our staff will then create a one of a kind arrangement with you in mind. 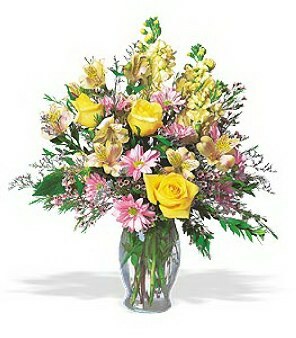 Floral delivery orders placed by Noon Central time may generally be delivered the same day in our local area. 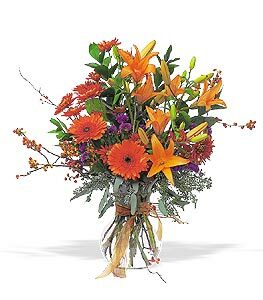 Designers Choice: Our talented designers can create a one of a kind arrangement for you in the colors or style of your choice. 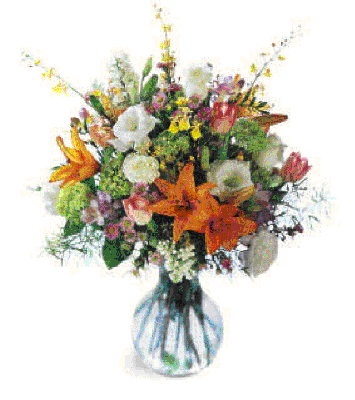 These arrangements can be made to suit most budgets. We use only the freshest flowers available for each season. You may request specific flowers, colors or style on the shopping cart page in the input box provided. 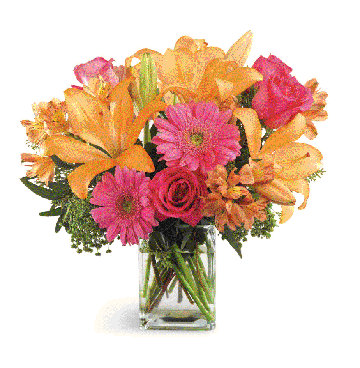 FTD B24-4138 Bright & Beautiful Bouquet. 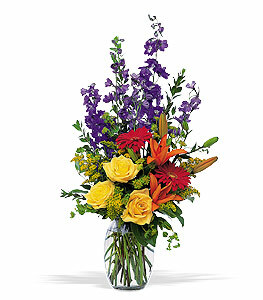 Roses, Larkspur, Stargazer Lillies and Double Lisianthus gracefully arranged in a a carefree vase design. Sure to brighten anyones day. 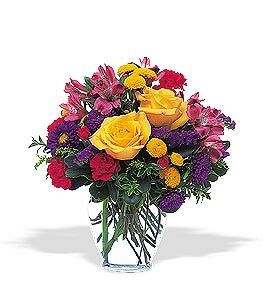 FTD B26-3466 Daylight Bouquet. 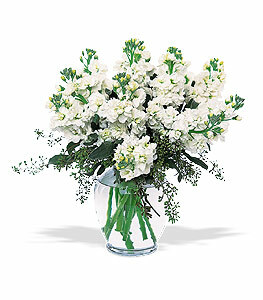 A fresh mix of subtle shaded fragrant seasonal flowers including tulips, roses, freeshia, Asiatic lillies, Double Lisianthus, and Monte Casion Asters presented in a clear vase with fresh cut greenery. .
C12-3005 Simply Daisies Bouquet. 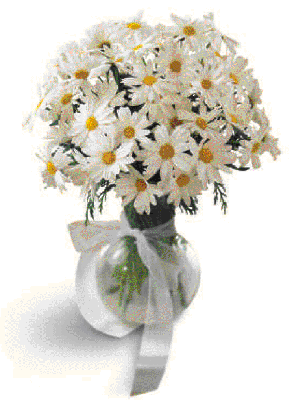 What could be cheerier then a simple clear vase brimming with fresh cut daisies. 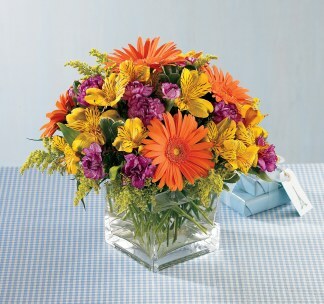 Sending this arrangement is like sending a vase of smiles to somene special. Available in all white (as shown), Yellow, Lavender or mixed colors. Please specify color selection on the shopping cart page using the input box. 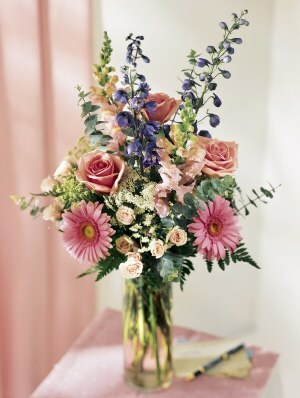 Simply Charming Bouquet. 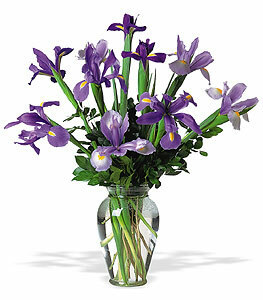 Regal Dutch Iris showcased in a clear vase with fresh cut greens. A perfect arrangement to sooth somones frazeled nerves. Iris are sometimes available in Yellow or White as well as the classic Dutch Blue. Stock vase arrangement. Available in many shades of lavender, pink or purple as well as white. $35.00, $45.00, $55.00 each ( size of vase and total flower content determines price ) Colors may vary ask for selections available. 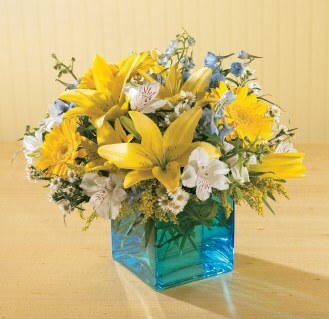 Sizzling Summer Vase Arrangement with Lily's and other seasonal flowers. 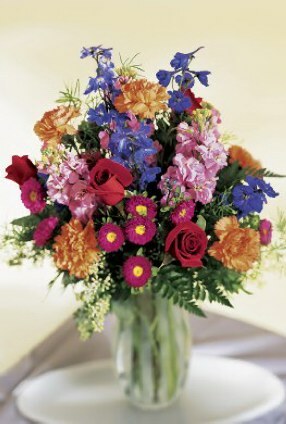 Colors and flower mix may vary ask for selections available. 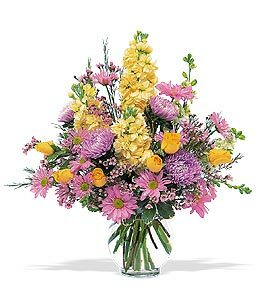 Mixed Spring Vase Arrangements with Spray Roses, Stock, Asters and poms $47.50, $52.50, $67.50 ( size of vase and total flower content determines price ) Colors and flower mix may vary ask for selections available. 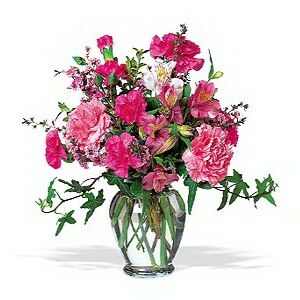 FTD PIC FTD Pick-Me-Up Bouquet. 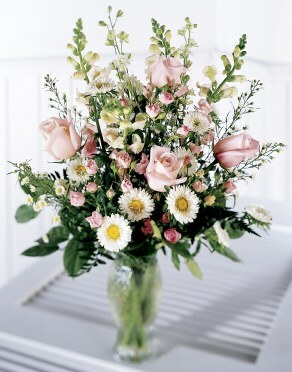 For the love of your life to make her feel better and to let her know that you are thinking of her. 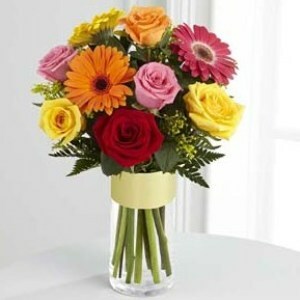 An assorment of bright roses and gerbera daisies. 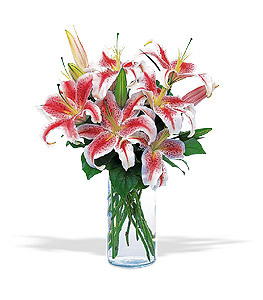 We can also wire flower arrangements anywhere in the world for you through FTD, or the "Florist Shop Network" or the Floral Source International. 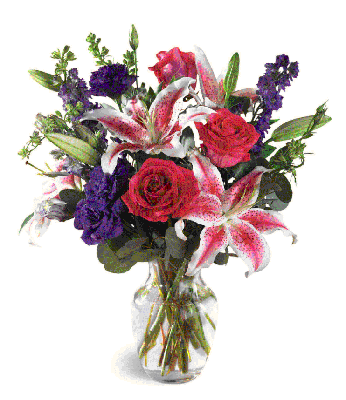 "SRP= Suggested Retail Price" This price may vary and is set by each independent FTD florist. Orders sent beyond our local delivery area will be accessed a $5.00 relay charge plus the actual delivery fee as required by the delivering shop. This fee is not included on the shopping cart page. Prices in larger cities such as New York , Los Angeles, Dallas or Orlando may be higher. Orders placed by noon Central time can be delivered the same day in most cases.